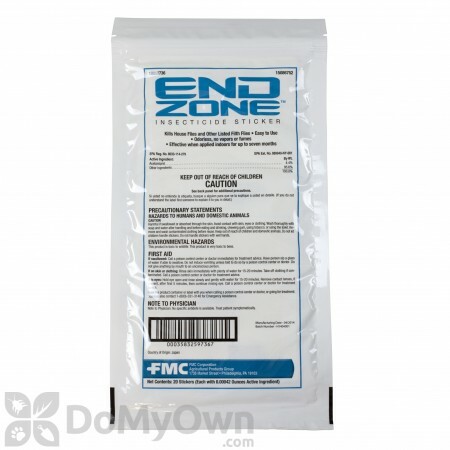 EndZone Insecticide Sticker by FMC is used for the knockdown of the following filth flies: little house flies, house flies, bottle flies, blow flies, phorid flies, flesh flies, fungus gants, and vinegar/fruit flies. There are no vapors or fumes released. The product features a bittering agent to prevent accidental ingestion. Each sticker has a coating that is attractive to listed filth flies. After the flies ingest the coating, they die within 1 minute. Flies will usually die underneath the sticker and dead flies do not stick to EndZone Insecticide Sticker. Easily remove the dead flies using a vacuum or broom. Simply place a sticker near the filth fly resting, feeding, and breeding sites. Stickers may be placed in kitchens, commercial trash areas, and food storage areas. Stickers can be used near light sources, on windows, and other surfaces where these flies congregate. Stickers can also be adhered to the inside and outside of fly lights or light traps as well as fly bait stations. This Endzone Insecticide Sticker can be used with a catch basin, just be sure to remove any dead flies on a routine basis. Be sure to place the stickers in areas where they will not get wet and keep them dry after application. How many stickers you use will be based on the area and size of where the flies are found. The use of one sticker per 1000 cubic feet of space is the recommendation. More stickers are used for heavy infestations. Place one sticker per window for quicker results or in rooms with high infestations. Stickers should be replaced indoors after 7 months and outdoors after 4 months or on a as needed basis. Replace stickers more often when contaminated by filth, dust, dirt, and etc. Keep out of reach of children and pets. The number of stickers to use us based on the size and area where flies are found breeding, resting, and feeding. One sticker per 1000 cubic feet is recommended. Use more stickers per 1000 cubic feet for heavy infestations. Keep stickers dry after application. Replace stickers that were applied indoors after 7 months or outdoors after 4 months or as needed. Replace stickers sooner when contaminated by dirt, dust, filth, rain, water, and pesticides. Features a bittering agent to discourage accidental ingestion. Put it on the inside of lids of garbage cans... can was never emptied - flies were gone in 24 hours. look for spots where flies rest. duct tape will kill more flies than this stuff, tried under trash can lid, windows inside and out with no sign of dead insects. We were introduced by a local exterminator company, of course at a much greater cost. It helped but needed refreshed with new product. Buying the package we did, we have plenty for the next round in a few months. Our fly problem appears to have pretty much been eliminated. We are attributing most of the progress to the success of these pads. There is no odor. All good. I have tried this on a limited scale and have found as an indoor product it works. After placing two in my home I would notice a fly come in when the door opened, notice it for a little while, then it was gone. I can live with that! 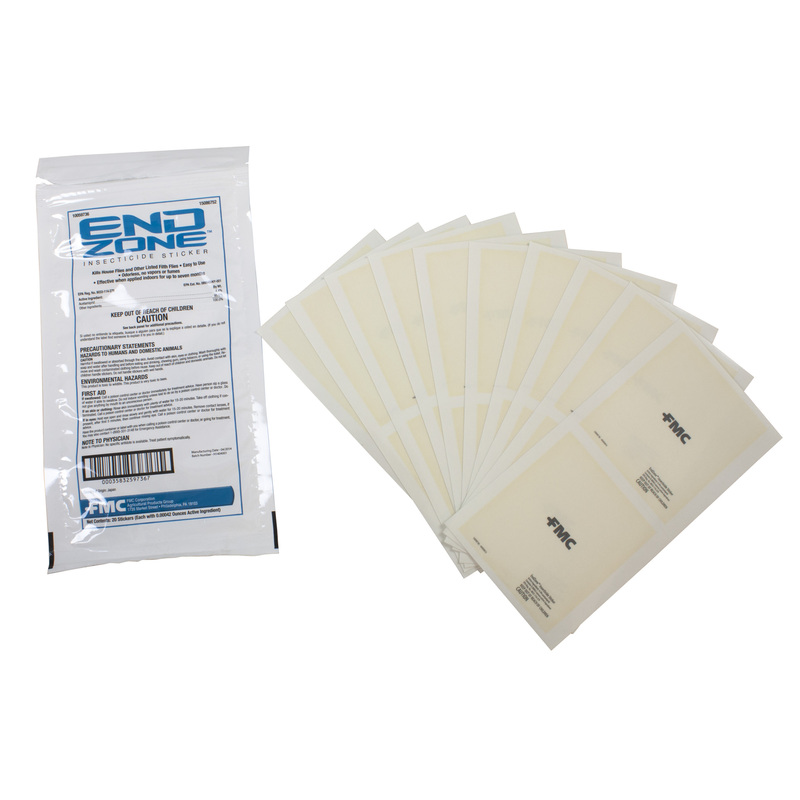 Can the EndZone Insecticide Sticker be applied to dry wall in an area with no windows? EndZone Insecticide Sticker can only be applied to windows. It may strip the dry wall. How do I properly peel the EndZone Insecticide sticker??? 2 sides, one side has a clear sheet, other side isn't. Which side sticks to the surface, and which side faces out for flies to munch on? Stickers have an adhesive coating on one side and a plastic cover on the other. With dry hands remove cover from the adhesive coating side first. Please sticker in desired location. Once sticker is adhered, remove the plastic cover to expose the attractive coating. 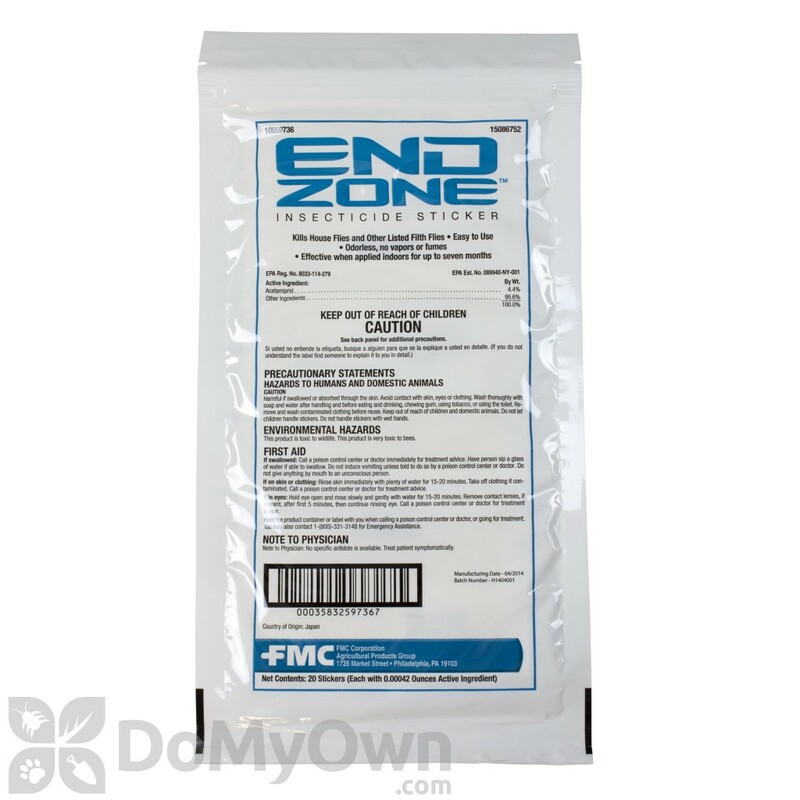 EndZone Insecticide Sticker by FMC is used for the knockdown of the following filth flies: little house flies, house flies, bottle flies, blow flies, phorid flies, flesh flies, fungus gants, and vinegar/fruit flies. There are no vapors or fumes released. The product features a bittering agent to prevent accidental ingestion. Each sticker has a coating that is attractive to listed filth flies. After the flies ingest the coating, they die within 1 minute. Flies will usually die underneath the sticker and dead flies do not stick to EndZone Insecticide Sticker. Easily remove the dead flies using a vacuum or broom. Simply place a sticker near the filth fly resting, feeding, and breeding sites. Stickers may be placed in kitchens, commercial trash areas, and food storage areas. Stickers can be used near light sources, on windows, and other surfaces where these flies congregate. How long are the EndZone Insecticide Sticker good for when stored in the box? If I only use 10 this year, will the other 10 be good next year? Per the manufacturer the EndZone Insecticide Sticker will last at least 2 years or more. They are not active until the plastic covering is removed from the sticker so as long as it is intact they should be effective for that long. 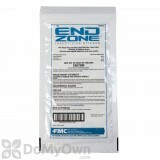 What exactly do you get with EndZone Insecticide Sticker? What size? Is it stickable to wall, damage free? transparent? any odors? is it safe to touch? EndZone Insecticide Sticker will not damage the wall. It is a sticker that peels off easily. It is transparent and you should only hold areas on the outer edge when removing.